Nilfisk HPW is a leading manufacturer of professional pressure washer equipment, announced its participation at the PowerClean 2018, October 19-November 1 at the Caribe Royale Hotel in Orlando, FL. Exhibiting this year at booth #503, Nilfisk HPW will be showcasing an expansive product portfolio found within each of their brands of high pressure washers by Nilfisk, Hydro Tek and Pressure-Pro. With over several decades of cleaning expertise, they develop and manufacture high quality products that represent the latest technology and innovation in the pressure washer industry. Whether the need is for a home improvement project, an outdoor surface with stubborn grime, or a semi-professional or industrial job, they have the machines you need for projects both big and small. Choose from any one of their machines to assist with tackling the most rigorous of cleaning jobs to bring back the shine. and heating performance. It is the ideal hot water unit for general light everyday cleaning in applications such as automotive, craftsmen and light farming. E4040HG, 4gpm @ 4000psi, offers a revolutionary aircraft grade aluminum frame with dual handles, lifetime frame warranty, adjustable pressure unloader with a GX390 Honda engine. AZV88, a portable recycling system used in protecting the environment from wash water runoff and complying with governmental storm drain regulations is simple, economical and effective to use. Nilfisk HPW – High Pressure Washers experts will be available in booth #503 to consult and discuss needs for specific industry applications. For more information on Nilfisk HPW – High Pressure Washers machines, please visit NilfiskHPW. As you shop for the perfect commercial pressure washers for your unique needs, what are the most important things to look for? This can be a tough question to answer. You know that you need a strong piece of equipment that is going to help your business thrive – but what do you need? It wasn’t long ago that your options were limited by the available selection in your local store. Today you can shop for hot and cold water pressure washers from companies that offer just about every pressure washer you can imagine. You can compare models at your convenience and even get advice from experience pros by calling Pressure-Pro at 772-461-4486. Read on to get the basics and then reach out for help with your unique needs. It doesn’t matter what your business is, what your budget is, or what your needs are, you will have three main options: Electric, gas, and mounted. There is no specific option in this list that is better for all needs. At Pressure-Pro we are proud to offer all of these options and many more. However, read on to get the basics of each of these three common choices to see if you can find the right choice for your needs. If you have very specific needs then an electric commercial pressure washer may be the best choice as it provides more options compared to the others listed. For example, you can find electric models that are hot or cold, handheld, and even trailer mounted. One of the biggest pros of choosing one of these options is that they can be used indoors, which makes them the only choice for a kitchen, restaurant, meat-packer, etc. If you just need to clean then cold water is likely enough but if you also want to sanitize, then hot water commercial pressure washers are likely a better option. There are numerous options within the category of gas commercial pressure washers, including hot water, cold water, and belt-driven. 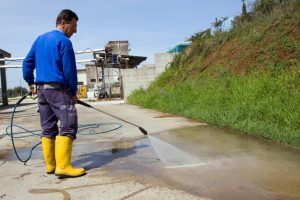 They are often chosen by those in industries that need to clean agricultural equipment, for large home cleaning, or for any major cleaning task. Gas pressure washers are built for heavy usage so they can take it all. If you are willing to accept nothing less than the biggest, best commercial pressure washer on the market, then you are rea looking for a vehicle-mounted pressure washer. You can get a trailer mounted unit, which we offer, or you can mount a unit directly to your own pickup. This means you can clean anything you can drive up to. It’s true that these are the most expensive option but that’s because they offer the power needed for cleaning commercial buildings and other large structures. What is the first thing to consider when shopping for gas pressure washers? How do you compare gas options to other models? These are tough questions for anyone who does not have a lot of experience with power washers. The good news is that you have a partner to help you. At Pressure-Pro we can assist you from start to finish in ensuring you find the right gas pressure washers for your needs. Keep reading for the basic pros and cons of gas pressure washers. Then shop our huge selection of power washers, parts, accessories, pumps, surface cleaners, and much more. If you have additional questions, please contact us at 772-461-4486 or for assistance. If you are comparing gas pressure washers to electric models, then the main advantage of a gas powered washer is the fact that it offers higher pressure. This means you can clean larger areas in less time and get a more thorough cleaning. As a result, it is an easy choice for anyone who has heavy duty needs for their pressure washer. If you choose a hot water option, then you can clean most substances from most surfaces without the use of chemicals. For example, clean off your deck, siding, or driveway without chemicals. Get rid of gum, tree sap, and mildew. While an electric power washer is not likely to have enough power to handle all of these issues, most gas powered pressure washers do. When you compare gas pressure washers to electric pressure washers, the gas version is going to be much louder. This makes it a potentially poor choice for someone who lives in a residential area and plans to use their unit regularly. They are also much heavier than an electric unit, which can make them a poor choice if you will need to move it regularly. As is true of any machine that uses a gas engine, there is maintenance involved when you own gas pressure washers. They do require tune ups, oil changes, etc. If they idle for a long time, the pump can become overheated and the safety valves will have to kick in. If you’re using your washer in a cold part of the country, then you will need to winterize it on account of the fact that you cannot use or store these units indoors. As you can see, there are both pros and cons to choosing gas pressure washers. Are they the right choice for you? That depends on a number of factors. What is certainly true is that no matter if you are looking for gas or electric, Pressure-Pro has the selection you are looking for. You can also reach us directly if you need help choosing the right model. Just call us at 772-461-4486 or email us at . The 3 Main Types of Hot Water Pressure Washers: Which is Right for Your Needs? If you are just beginning to shop for hot water pressure washers, then you may very well be overwhelmed. After all, there are so many options that it can seem impossible to understand them all and choose the best. The good news is that Pressure-Pro is here with the selection you need, along with the experience and customer service to help you decide which option is right for you. Read on and then contact us at 772-461-4486 or if you have questions. We will go over the three main types of hot water pressure washers, including gas, diesel, and electric, but first we want to encourage you to understand the specifics of what you are looking for. You know that you need more power than you would get form a garden hose, but how big is your project? How often do you plan to use your equipment? Where do you think you will use it? Does it need to be powerful? Answer these questions and then read on to make a final decision for your needs. Our gas-powered pressure washers require less time and effort than others. This means that they work faster and more efficiently and are a great choice for large areas and for use outdoors. You can use them for just about any cleaning purpose you can imagine, including peeling paint, cleaning dirt and debris, and getting rid of grease and grime. One of the main advantages of the gas powered pressure washer – other than its maximum cleaning capacity – is the fact that it is entirely portable. There are no cords involved, which means you can take it on the road, put it on a pressure washer trailer, and otherwise use it in many areas. However, note that you should never use one of these gas power washers in an area that is unventilated as it does give off fumes. 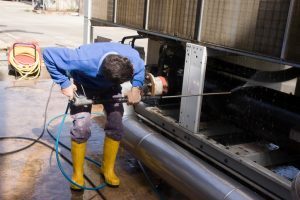 If engine life is one of the most important factors you consider when choosing hot water pressure washers, then a diesel unit may be the best choice for you. It can also handle the toughest, most stubborn jobs. Are you dealing with grease that you can’t get rid of? Get diesel. Are you paint stripping or removing gum? A diesel power washer can handle just about any job. One of the biggest advantages of these hot water pressure washers is the fact that they can be used in unventilated areas. For example, they can be used to clean within a garage, kitchen, or basement. However, they do have cords and they must be plugged into an electric outlet. This can make them less portable than other options. When you are in need of pressure washer parts, there are a number of factors to consider. At Pressure-Pro we want to make the process as simple as possible. Read on to learn how we’re doing that and then reach out to us at 772-461-4486 or reach us at with any questions. The last thing you want is to be forced to work with half a dozen companies just to get the various pressure washer parts you are in need of. Instead, work with a company that carries a huge selection of brands, parts, and more. This is what you will find with Pressure-Pro. Of course, if you want the best possible selection of anything, you are likely to have the most success shopping online. Pressure washer parts are no exception. When you shop online, it’s easy to see if a part is compatible with your pressure washer, what its specs are, and what other options are. Shopping online also allows you to compare prices and options. In short, it is the fastest and easiest option. Unfortunately, too many consumers accept that shopping online is convenient but it necessarily means that they cannot have good customer service. 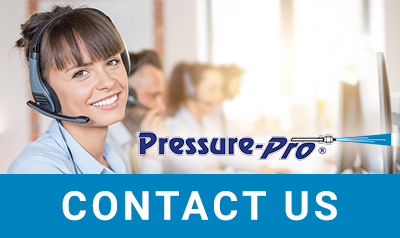 You will be glad to know that at Pressure-Pro we work tirelessly to ensure that you not only get great prices and plenty of options, but you get great customer service as well. In fact, we have two locations in the United States, one on each coast. This means that no one is all the way across the country from our location. Who wants to wait weeks or months for pressure washer parts? We do not accept that you have to. The fact that we have two offices, one on each coast, helps us to significantly increase shipping speed to many customers. Some of the most purchased parts over the year got that reputation for a reason – they are good brands and good parts. We are sure to carry these, such as the Slap Happy plumbed pumps. On the other hand, we also know that we live in an age where constant improvements and innovations are constantly making it to the market. We are sure to keep up on those options to. The bottom line as you shop for pressure washer parts is that you need the power of choice. You need to have options, you need to have value, and you need quality. You will find all this and more when you choose Pressure-Pro. Electric Pressure Washers Are Great for Many Buyers: Are You One of Them? 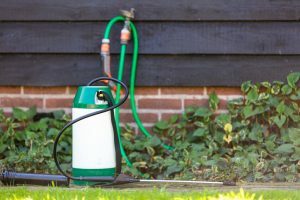 As you shop for the right pressure washer, you have three main options to consider: Electric pressure washers, gas pressure washers, and diesel pressure washers. At Pressure-Pro we offer a wide range of all types of pressure washers and we do not believe that any particular one model or type is best for every project or need. That said, each project or need has one power washer that’s right for it. It may be that electric power washers are the right choice for your needs. Read on to learn more about this option and then feel free to reach out to us at 772-461-4486 or if you need assistance. One of the most important things to know about electric power washers is that they are excellent for cleaning. That said, remember that this is not the same thing as stain removal. If you are looking for a heavier duty pressure washer to strip paint, then you should look elsewhere. They do not have the same level of pressure you will get with an electric or gas option, which means that it does take longer to clean with them. 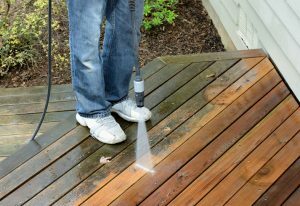 This may not be an issue if you are using it clean your back deck, but could be an issue if you need a pressure washer to clean a commercial building. If you are worried about how loud power washers can get, then electric pressure washers are definitely the choice for you. The fact that they do not have gas engines means that they run much more quietly. Likewise, the lack of a gas engine makes them much more lightweight than other options. If you plan to take your power washer on the go, then an electric option is much easier to carry. When you choose electric power washers, you can use them within a cords-length of a power outlet. Even if you find an electric outlet near the area you need to clean, it will only work as far as the cord goes. Note that the hose for an average power washer is around 25 – 30 feet and the average power cord is around 35 feet. Electric pressure washers are more affordable for a number of reasons. 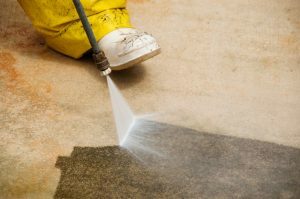 First, they are less expensive to buy when you are shopping for a pressure washer. Second, they require almost no maintenance, which can save money on the long-term cost of running it. Finally, they do not require expensive parts and other upcharges. What power washer is right for you? Contact Pressure-Pro at 772-461-4486 to get help choosing an option from the professionals. What is the most important thing to look for when shopping for industrial pressure washers? Price? Power? Usage? All of these are important factors but there are many more. Read on to learn about the most important elements you must insist on when buying a commercial pressure washer. Then shop with Pressure-Pro, give us a call at 772-461-4486, or email us at . If you are looking for industrial pressure washers that can offer truly intensive cleaning then gas pressure washers are likely the right choice. One made for regular use can get up to around 3,100 PSI but industrial power washers can get over 5,000 PSI. That said, remember that more power isn’t always what you’re looking for. If you get a machine that has more power than necessary, not only are you wasting money on a more expensive unit, but you are increasing the likelihood of damaging furniture, paint, etc. Do get a higher PSI model if you need – but only if you need. It’s true that gas power washers are the strongest, most powerful option, but they also require the most service and maintenance. On the other hand, while an electric model does not offer the power you’d find with an industrial option, it does not have significant maintenance needs. They are strong enough for most household jobs, though they may not be right for industrial use. There are two options for adjuster water pressure and scope – you can either use an adjustable spray nozzle or you can change your spray tip. Either way, you can closely adjust the pressure to get anything from a light fan-like spray that won’t harm a painted surface to a truly high-powered blast that can take on even the most stubborn of grime. It can be easy to move a pressure washer – but you must ensure you buy one that has what’s needed. 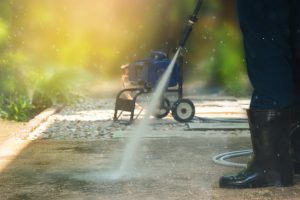 For example, if you plan to move your pressure washer regularly, then you will want it to have large wheels as well as a storage spot for the power code, water hose, and trigger. If you do not have these elements then you can expect a much more complicated moving process. Now that you know what you need, you are ready to look at your options. The good news is that at Pressure-Pro we offer a huge variety. If you need assistance deciding what works best for you or what accessories you may need, feel free to reach out at 772-461-4486 or . Diesel Pressure Washers: How Do They Hold Up Against Other Options? The good news is that there are so many options in pressure washers that you are virtually guaranteed to find exactly what you need. The downside is that there are so many options you may have trouble deciding on how. At Pressure-Pro we offer all the main options, including gas, electric, and diesel pressure washers. Read on to learn more about diesel options. Hopefully this will help you narrow down your options but remember that we are always here to help! Call us at 772-461-4486 or email us at . More powerful pressure washers tend to have higher performance ratings. The more powerful a power washer is, the faster it can clean. They are available with more parts and attachments to assure a customized experience. 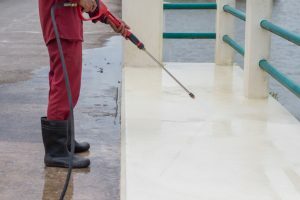 One of the main reasons that a person may choose a gas or diesel pressure washer is because they are great for cleaning in remote areas or other spaces where there are no electric outlets. In fact, they can even be used in an entirely remote area. If you want power and you need portability, then diesel may be the choice for you. Of course, while there are many things to appreciate about a diesel pressure washer, there are some drawbacks. First, the fact that it uses diesel means that it gives off fumes. As a result, you cannot use these pressure washers in enclosed spaces. This makes it a poor choice for some. Second, diesel pressure washers only work as long as they are well maintained. When you compare this to electric power washers, which require little to no maintenance, it can not only be an inconvenience but a costly affair. The fact that it relies on gas also means that it will only work as long as you have diesel in it. An electric model can run virtually forever, as long as it has power, but this is not the case with a diesel option. Once you run out of diesel fuel, you can no longer use the unit. There is no such thing as a perfect pressure washer but there is a right one for each situation. If you believe that diesel pressure washers are the right choice for you, contact Pressure-Pro at 772-461-4486 and let us provide you with the exceptional service, large selection, and expert advice you need.